A key metric when when considering on-line point of sale systems is speed of operation. 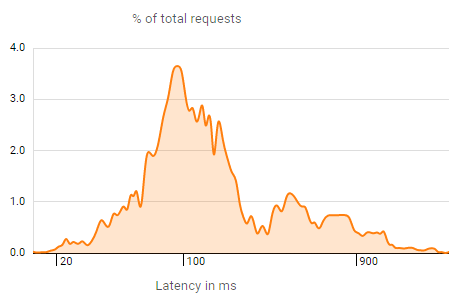 The graph on the left shows our typical "data-center" latency times. App Engine status is available here: Cloud Status Dashboard. The video on the left demonstrates our lightning fast load time and refresh time. Whether cold booting a computer or powering up a device after it has run low on battery level, app refresh & reload is an unavoidable process you'll need to do from time to time. Starting the app from scratch to printing orders is done in around 2 to 3 seconds! The video on the left demonstrates a "quick service" mode of operation. The fastest print speeds available: 300 mm/sec. Double sized fonts for distance viewing. Reprints / multiple copies / category splitting etc. Detailed latency and update times. Restaurant overview screen retrieval: Less than 30 milliseconds. Synchronization to other devices on the LAN: Less than 0.5 seconds. Change User, Sign in / Sign out: Instantaneous. Archiving of historical data, to users on line account: Less than 50 milliseconds. Inventory Increment / Decrement: Instantaneous (Globally Accessible). Inventory levels minimum / maximum alert: Instantaneous. Print receipt using Direct Printing: Instantaneous. Print to kitchen printer using Direct Printing: Instantaneous. Change/Update 100 menu items: Less than 1 second. Change/Update 1000 menu items: Less than 3 second. On Line to Off Line operation: Less than 10 milliseconds. Regular Customer search and retrieval: Less than 5 milliseconds. Customer Favourite Order look up and retrieval: Less than 5 milliseconds. TakeAway retrieval: Less than 5 milliseconds. Note: SplitAbility is a cloud based service and adds resources as required to maintain these latencies. Terminals / Registers / Tablets: Unlimited. Historical Data: Unlimited and held in your own account at your discretion. User Key or Password can use any characters and any number of characters. Stored Orders and TakeAways: Unlimited. Fully adjustable floor plans, both table position and size. Apple iPads, iPhones and any iOS device. All Android tablets, phones and devices. Windows desktop computers, notebooks, phones, tablets including Windows Surface.